On a recent trip to San Francisco, we took the hour-long journey down south to visit the headquarters of some of these companies. While it wasn’t possible to actually enter the offices of these places (unless accompanied by an employee), there are actually visitor centres that you can visit and lounge around. After all, these offices are not meant to be Disneyland: they’re actual spaces for employees of these companies to work. If you were thinking of making the pilgrimage to Silicon Valley, here is a basic guide on all you need to know about the area. Unless you are spending a few days as a visiting dignitary, you’re better off staying in the main city of San Francisco—flights here depart daily from Changi Airport directly by way of Singapore Airlines and United Airlines. If you don’t mind a connection, Cathay Pacific and Eva Air also fly to San Francisco International. Once you’ve settled in, there are a couple of ways to get to Silicon Valley. The most straightforward would be to take the BART to Millbrae Station, and then book an Uber or a Lyft from there to take you to your desired headquarter location in the valley. This total journey should take you around one to two hours, depending on the time of the day and the traffic situation. You can also choose to drive all the way down the 101 or 280 freeways. If you’re hell-bent on staying in Silicon Valley, there are a few hotels that are close by to all the various tech companies. The Four Seasons, Fairmont, Westin, and Hilton all have outposts in the valley. Another option is Hotel Nia, a 250-room luxury hotel that just opened earlier this year in Menlo Park. It’s more than just your cookie-cutter business hotel; it’s designed to be a lush oasis that’s in line with the Autograph Collection by the Marriott Hotel Group. With accommodation out of the way, you’re ready to hit up the 4 major cornerstones of any Silicon Valley tour. Photo: Jimmy Baikovicius via Flickr. As one of the largest exponentially growing tech companies in the world, the Facebook headquarters is an attraction unto itself. But it’s one of the most restricted offices in Silicon Valley, and its off-limits to visitors unless you have an employee escorting you around the campus. The only opportunity here for a photo is the thumbs-up sign at 1 Hacker Way. Google’s headquarters, Googleplex, can be credited with the trend of making offices cool again. Unfortunately, you can’t enter the offices to see how the Googlers work, but you can walk around all 12-acres of the Mountain View complex on a self-guided tour. There are also a couple of spots made just for visitors. Note: There is a visitor centre, but it’s reserved only for employees who are escorting their guests around the park. First, you’d want to make a stop at the iconic Googleplex building at 1600 Amphitheater Parkway, next to Charleston Park. We’d recommend coming when it’s still fairly light out, as the setting sun would cast a not-so-flattering dull glow over the campus, and make your pictures look dim. You’ll notice here the many Google-themed bikes that are reserved for Googlers only (they don’t want to be responsible if you fall!). Please don’t steal them, as the Wall Street Journal reports that for the longest time there have been thieving incidents regarding these colourful bicycles. Next, you’d have to walk a little to the Google Merchandise Store at 1981 Landings Drive. Here, fans of the Google ecosystem would turn into kids in a candy store. There are water bottles with Google and YouTube motifs, T-shirts in all the colours of the Google spectrum, and even an exclusive denim jacket, the Jacquard, that was designed by both Google and Levi’s. A minute away from the store is the Android Lawn, where life-size statues of previous Android versions stand around waiting for a photo-op. The Computer History Museum is the one place you can visit to learn more about the history of Silicon Valley and the overall outlook on technology, past and present. It would be recommended to go for the guided tour that would take about an hour. Otherwise, you can also download the CHM’s official app and embark on your own audio tour of their signature exhibition, Revolution: The First 2000 Years of Computing. You’d want to save the best for the last, as (honestly speaking) the other visitor centres would just pale in comparison. Apple has two headquarters: the original campus at 1 Infinite Loop, and the latest spaceship-esque Apple Park at 10600 N Tantau Ave in Cupertino. If you’re short on time, just make the trip to the new campus. 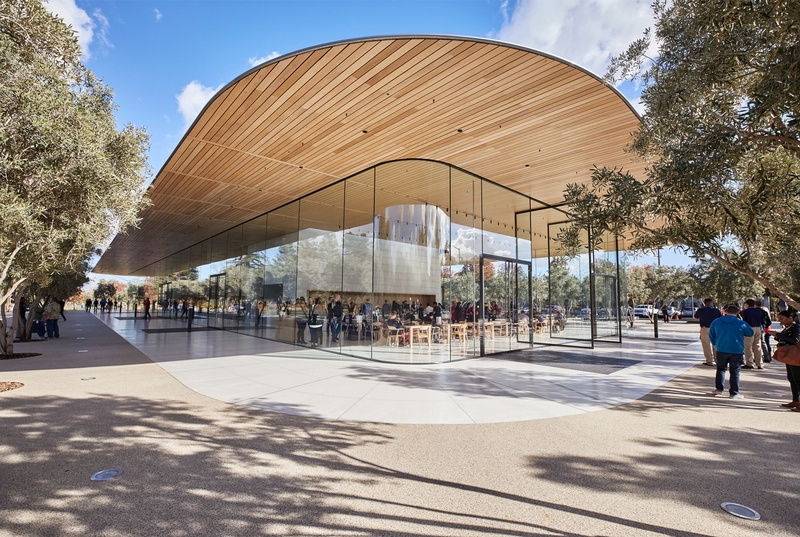 The visitor centre at Apple Park is not hard to miss, with its glass walls and the many tourists clamouring for a selfie at the sign. There are three segments to the visitor centre. The first is a 3D augmented reality exhibit of the entire campus, including the employees-only spaceship compound. Using iPads, you can move around the exhibit and peek into the design of the US$5 billion Norman Foster-designed offices by lifting the roofs on the buildings. You’ll really get a sense of how massive the entire area is. The biggest space in the visitor centre is the retail area that combines rows of Apple’s latest products with the signature “town hall” style for Today at Apple sessions. Here, you can cop a plethora of exclusive Apple merchandise like T-shirts and caps that are only sold at the store. Finally, you can take a breather in a lite-version of Caffe Macs, the Apple-branded cafe. Order an espresso and grab a seat outside amongst the olive trees.